“Russell Tungay had started on an autobiography which he called “Taming the Dragon” where he describes how he together with his parents and brothers came to the Cathkin Valley in the early 1950’s. The Tungay family used to holiday in the Cathkin Valley every year and one year Gwen “Ma” Tungay bought part of “old man Erfmann’s” farm when he subdivided it in 1955. In 1960, the oldest brother, Peter Tungay was killed in an air crash. This devastated the family as Peter had always expressed his desire to take over the farm and start a dairy. In 1963 the family started a caravan park on the farm to generate much needed money to keep the farm running. In the meantime, John Tungay, who was a choirmaster at the Trinity Congregational Church, approached his parents to take over the farm and turn it into a choir school. In 1966 John began adding onto the farmhouse a dormitory, dining room, kitchen and a classroom. It became clear to John right in the early days that in order to travel overseas, the choir had to be the best in the country. And in order to achieve this they needed 2 hours practice every day. His initial idea of trekking the boys to Winterton for their academic tuition had to be re-thought and that was when he asked his mother, “Ma” Tungay, to step in and help teach academics to the boys. 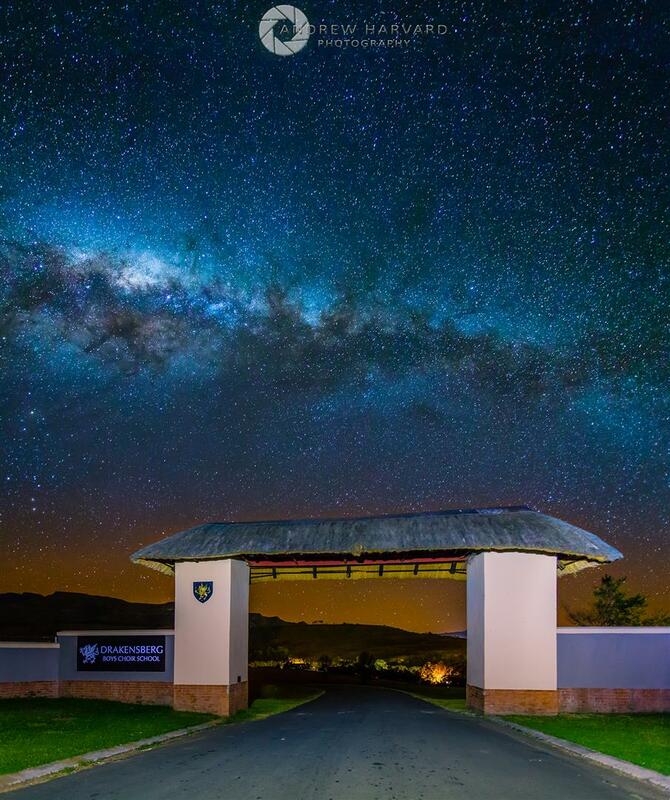 The Tungay family continued to play a pivotal role in the history of the Drakensberg Boys’ Choir School with Russell taking over the management of the school in 1968. The Tungay family sold the School and the 100 acre estate and buildings to a Board of Directors in 1981. Canon South Africa 6D from Orms, Canon EF 17–40mm lens, F4, 25 sec, ISO 6400. Led Lenser South Africa torch to see. K-Way SA jacket to keep snug. Very informative Andy. Thank you!